You will have noticed that Method Statements are being requested more and more these days by organisations of all sizes and in all industries. The reasoning behind this is so that they can comply with Health and Safety legislation which, requires them to determine the organisation is competent of any work they may be contracted to carry out. Include a step by step guide on how to do the job safely. Method statements must also detail which control measures have been introduced to ensure the safety of anyone who is affected by the task or process. 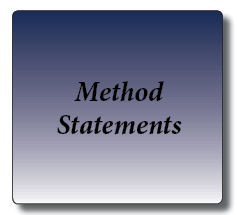 Method Statements can be requested at the tender stage which, allows the company to gain an insight into the organisation and the way in which it operates. These documents allow the company to demonstrate how it can provide its goods and or services in a safe and high quality manner. For these reasons Method Statements become another important document/brochure for the company, and it is important to have well-presented documentation to gain a competitive advantage over your competition. Writing Method Statements may seem a little daunting to begin with, however, by taking a pragmatic and constructed approach you will soon be able to follow the process which will enable you to write Method Statements with confidence. How do I write Method Statements? The first task is to carry out a Risk Assessment. A Risk Assessment will highlight the significant hazards and control measures required to prevent injury or ill health whilst carrying out the task. This will also provide details to add to your method statements. A Title e.g. Working Method Statements, or Standard Operating Procedure. A brief description of the works, task or process. Your company details, logo, name, address etc. Site contact details including emergency numbers etc. Document number, issue date, revision date, revision number etc. Section 2. Can be used as a summary of the main hazards that are present and the control measures that must be implemented. This section should also be used to list the Personal Protective Equipment (PPE) that must be worn. The information for this page will be extracted from your risk assessment document. Section 2 can also be used to detail any Environmental or Quality procedures that must be under-taken during the task. Machinery shutdown and lock off procedures. Scaffold & Access to height. Section 4. This section is the step by step guide, use this section to explain in detail the steps that must be taken to ensure the task is carried out safely, include all relevant details in the order that you expect them to be carried out. Are you still struggling to write your own method statements then contact FFM today and we will help.